Raptor conservation is the cornerstone of our mission at RAPTOR Inc. 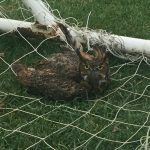 In addition to being the premier site for treating injured raptors in the Greater Cincinnati area, RAPTOR Inc. conducts educational programs to increase awareness of the importance of raptors to our environment and participates in field projects to aid in their protection. Birds of prey provide many valuable environmental services. They help control populations of pest species such as mice, rats, and insects. They remove carrion from the environment, reducing the spread of disease. They also serve as key indicators of environmental contamination. In many instances the birds admitted to our rehabilitation hospital sustained injuries from contact with people or our man-made obstacles. By taking a few simple actions we can significantly reduce our negative impact on wildlife and help preserve these magnificent creatures for future generations. Dispose of trash in appropriate receptacles and pick up trash around roadways. Raptors are attracted to the small mammals which eat the morsels of food left on litter. Removing litter along roadways reduces the chance of raptors colliding with vehicles. Remove sport netting during off-seasons. Properly dispose of fishing line or kite string to prevent raptors from becoming entangled in them. Use care when hanging Christmas lights, making sure lights are tightly secured to the structure with no hanging loops that can cause entanglements. Do not release helium balloons into the environment! Entanglements can cause life-threatening injuries. Use opaque basketball backboards rather than clear backboards so that birds can see the obstruction. When hunting and fishing, switch to lead-free fishing gear and lead-free ammunition. Only a tiny amount of lead can cause fatal poisoning in raptors. Raptors can consume lead from scavenging on carrion or gut piles, or from eating birds that have accidently ingested lead. Burying gut piles can also be beneficial. Discourage the use of pesticides/insecticides to prevent the indirect poisoning of raptors. Use snap traps instead. Watch raptors responsibly. Many people enjoy watching raptors, but it is important to enjoy them without disturbing them. Maintain adequate distance to prevent displacing a bird, which can cause a thin bird to waste valuable energy. Protect habitat around nesting or roosting sites. 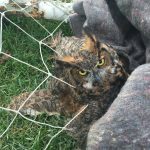 Support local wildlife rehabilitation centers and the comprehensive work they do! Window strikes kill between 2% and 10% of the U.S.’s bird population every year. Birds hit glass simply because they can’t see it (people can’t either, but we are more likely to know it is there). What birds do see, however, is often a reflection of landscape and sky – an illusion of a clear pathway. Green habitats inside buildings with see-through glass can be misleading as well. In addition, windows or doors on opposite sides of a building may create the appearance of a clear pathway. Birds can attempt to fly through these areas with devastating results. Fortunately, there are several things you can do to make your windows safer for raptors and other birds. Provide Visual Cues – Placing stickers, silhouettes, or Window Alerts on the outside of windows and glass doors makes glass more visible by reflecting UV light, which is invisible to us but highly visible to birds. There are many great options available and they are either highly attractive or all but invisible to humans (what you choose depends on your preference). Hanging strings of beads or shiny materials outside windows can also help. Placing indicators on the inside of the glass is less effective because it doesn’t reduce the reflection. 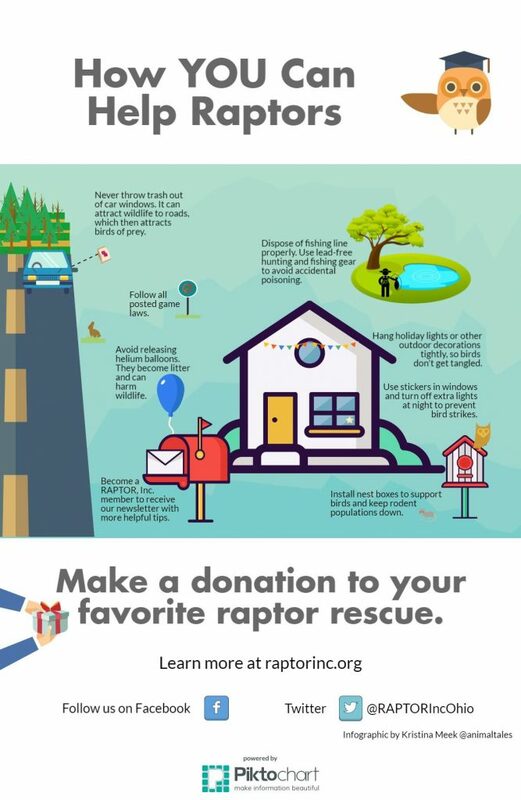 You can purchase window strike prevention products on Amazon – and if you’ve designated RAPTOR, Inc. as your Amazon Smile charity, you’ll be helping raptors even more. Install Window Screens – Window screens installed over windows reduces the impact of a collision and may save a bird from catastrophic injury or death. Screens also reduce the reflective properties of windows, making them more visible and less deadly to raptors and other birds. Turn Your Lights Off at Night –Most migrating birds fly at night. Lighted windows can easily disorient or distract birds, causing fatal crashes. 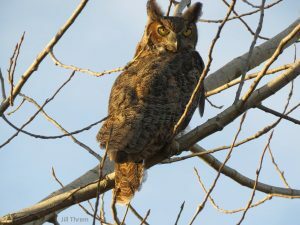 Owls are also active at night and at greater risk for window strikes during that time. Lights Out programs across the United States can reduce fatal window strikes for migrating birds at night. If you’d like to learn more, visit the Fatal Light Awareness Program (FLAP) website. It is often suggested to use netting to protect birds from window strikes. RAPTOR Inc. does not advise the use of netting since we receive many birds with serious injuries from their struggle to free themselves from entanglements. There is a shortage of suitable nesting sites for many of our cavity-nesting birds. Installing nest boxes can help support bird populations while creating a unique opportunity to observe these wonderful creatures up close. Providing raptors with nest boxes is also a way to encourage a natural form of rodent population control on your property. For detailed information about nest boxes, visit the Cornell University’s NestWatch website. 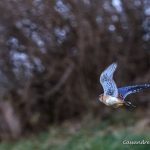 American Kestrel Partnership – In large portions of the United States, American Kestrel populations have been steadily declining. The causes are not clear, but it is suspected that many factors are to blame such as predation by increased Cooper’s hawk populations, environmental contamination, habitat loss or change, and competition with European starlings for nest cavities. Through the years RAPTOR Inc. has noticed a substantial decrease in the number of American Kestrels received in our area – 65 admissions in 2000 compared to 15 in 2015. RAPTOR Inc. is doing our part by installing nest boxes for these small falcons at key habitat locations. 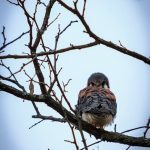 If you would like more information regarding how you can help American Kestrels too, visit the American Kestrel Partnership website.